What type of service level does my property require? Is my snow contractor competitively priced? Does my snow contractor have the equipment & materials needed to handle my property? Service level entails the timely removal of snow in a manner that meets the property management's standards. In order for commercial snow removal companies to achieve the optimal level of service, they need adequate prep time to make sure everything will run smoothly. Snow removal is a costly service for both the snow plow contractor and the customers they serve. Snow contractors have to plan ahead for not only labor, but equipment and salt, as well. All of these items have to be estimated and strategically forecasted for an upcoming season. Snow contractors aim to get their snow contracts lined up by late summer/early fall in order to prepare for all of the variables involved in snow removal. Property and facility managers should seriously consider contracting early so their properties will be suitably routed and accommodated with the right equipment, labor, and ice melting materials when the first snowstorm hits Northeast Ohio. Your commercial snow removal company should have the equipment and labor necessary to remove snow and ice at any given time. This in turn provides a safer environment for employees, residents and visitors to your property. 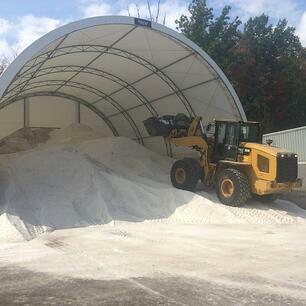 In addition to equipment and labor, commercial snow removal companies also have to buy enough salt to last them through a season. In recent years, many contractors were caught off guard by widespread salt shortages and found themselves scrambling to keep their properties protected. Don't leave your property vulnerable because of an unprepared contractor. They should be pricing all of their snow removal services based on years of strategic planning of snow fall and customer needs. Your snow contractor should have a system in place to hire and retain employees throughout the entire winter including subcontractors, machine operators and snow shovelers. Offering different tiers of cutting edge, up-to-date equipment is a must, allowing the capability to customize your snow removal services based on the size and needs of your property. Utilizing technology and contracting with consulting meteorologists helps alleviate any “surprises” of approaching inclement weather. And most importantly, when the snow starts to fall, commercial snow removal companies should pride themselves on providing top-level service 24 hours a day, seven days a week…assuring you that your property will always be protected.